Grey skies and rainy days are ahead of us. (Sorry for the reminder) We are taking our umbrellas everywhere and leaving at home all things summery. So, what are you doing with your sunglasses? Artist Jorien Röling has put all kinds of styles to use and created hippe brillen. However, there is more to her work than recycling. “Sunglasses are big shiny black things that people put in front of their eyes. It prevents others from seeing expressions and it looks like people wearing them are indifferent, don’t care, have more important things to do,” Röling said. The glasses I make are meant to look funny. They have a message and seek contact. 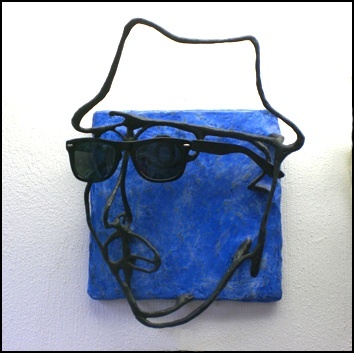 The sunglasses will be in an exhibition at De Stoker gallery and available for purchase starting December ninth. Each unique colourful creation will be sold for €50,-, and all earnings will be donated to Mama Cash, which is an organisation that raises funds to help women and women’s groups worldwide. 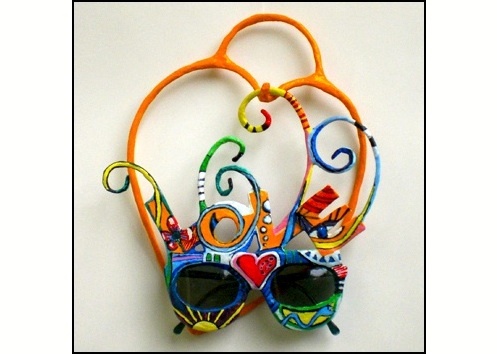 If you are interested in this cause, you can help the artist by sending her sunglasses that you don’t care for, or that you know you won’t be using next summer. You can contact the artist at jorienroling@gmail.com or send or drop off the glasses to Witte de Withstraat 124, 1057 ZH Amsterdam.